After losing the presidential elections in 2000, Al Gore has re-invented himself as a campaigner to stop climate change, which has earned him an Oscar, an Emmy, and now the Nobel Prize for Peace. Photo by Time Magazine. Former US vice-president Al Gore can add a Nobel Prize to the Oscar and Emmy he has won earlier for his "An Inconvenient Truth" documentary, which looks at the effects of global warming. 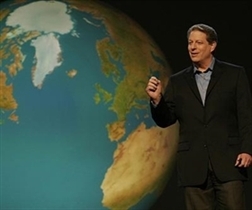 Gore and the United Nations Intergovernmental Panel on Climate Change (IPCC) have been awarded the highly-sought prize "for their efforts to build up and disseminate greater knowledge about man-made climate change," said the Norwegian Nobel Committee, which awards the prize. The committee also praised their efforts "to lay the foundations for the measures that are needed to counteract such change". The film has helped put climate change at the top of the global agenda, even if its conclusions have not been unanimously accepted. Friday's award is likely to add even more attention to the UN conference that will meet on Bali in Indonesia in December, which will seek to launch talks about widening the Kyoto Protocol green-house emission cuts beyond 2012.